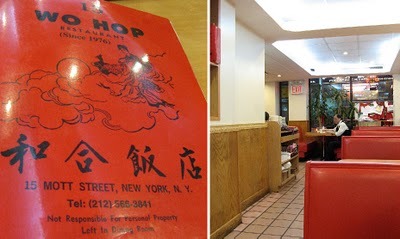 Make sure you go to the street level one, on 15 Mott St and NOT the basement one on 17 Mott St. Very old school. Nothing fancy, with dinner style comfy red leather booth (great for any “friend” who had too much fun and can’t sit up). It’s never crowded during late night hours and like any good chinese place, food comes in a blink of an eye. The dish to get is – repeat after me: “Wa Dan Ngau Yok Fan” (Swirly Egg with Beef) for $4.50! (last time I couldn’t find it on the menu, but I got you covered, so now you can order in Cantonese! or at least amuse the waiters) Gosh, Chinatown is such a steal. Most places make this dish sans soy sauce, I like this version much better. Tender beef, savory corn starchy thick soy based sauce and swirls of slightly cooked eggs. Soooo good with pipping hot n’ fluffy white rice! Not my choice for any other time of the day, but late nights after a couple shots, this is a tummy pleaser. It’s open ’til 5 am, one of the many reasons I just *heart* NY. The weather outside is frightful, but this Sul Long Tang is so delightful… specially when it’s 4 am and there’s no place to go. Here’s my steaming hot bowl of Sul Lung Tang (white ox-bone soup with rice, noodle and thin slices of beef. The bone and meat are cooked for more than 12 hrs and all the fat and oil is removed). It’s milky and hearty, yet not heavy. I like how you can add scallions and salt to taste. As you can see, I like a lot of scallion. 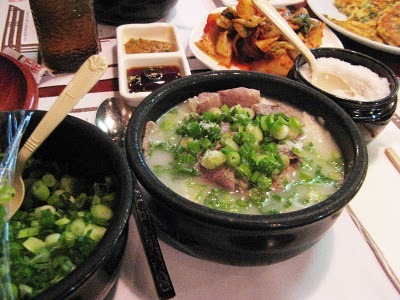 A warm bowl of soup really hits the spot after a long night, specially during these brrrrrrr chilly days. The waitress also comes with a whole pot of kimchi! which goes really well with a lightly seasoned soup, I try not to add too much salt. This is my last post of 2009! Just wanted to thank everyone for reading, commenting and encouraging me these past 6 month. It’s been an awesome and fruitful year. I traveled, ate, blogged and repeated over and over again. Met many fun and interesting fellow bloggers and looking forward to all that’s in store for the coming year. 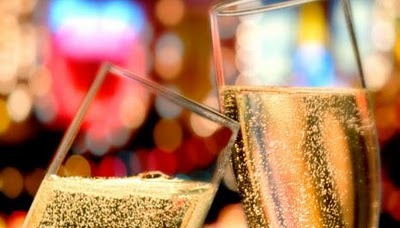 Cheers to the yummy eats ahead in 2010! God Bless you all! I love that Gahm Mi Oak is opened 25 hours. Happy New Year! So happy I found you…I love your take on eating, and am always happy to learn about eateries in NYC! Oh wow if you're going to eat drunkenly, it should be delicious looking food like that! 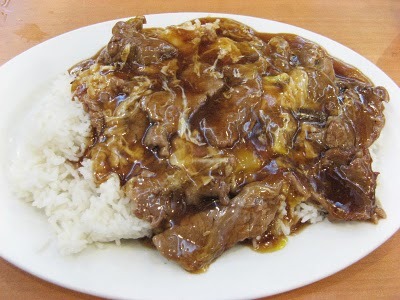 beef and egg over rice at Wo Hop is my favorite dish! !